Getting her Christmas tree green on, Victoria Justice was at the all wrapped up in a Calvin Klein coat. Victoria teamed the festively-colored coat with shimmering Joes Jeans and black leather Tsubo boots plus leather gloves too. Victoria's Glitter Coated Joe's Jeans Skinny Jeans. Irina Shayk cut a sultry figure in all black while at the December issue launch of Spanish Vogue. Irina wore her black Stella McCartney blazer and trouser suit with nothing underneath for a touch of femininity, plus an Hermes clutch bag, and YSL platform heels. The black YSL Tribtoo shoes used to be the shoes to be seen in, and have been worn by most stars at some point including Victoria Beckham, Paris Hilton, Jennifer Morrison, and Kendall Jenner. Get a similar look with the Kelsi Dagger "Linzy" Black Patent Heels which cost $74.00. At the Target + Neiman Marcus Holiday Collection event in New York City which was also attended by Karlie Kloss, Kate Bosworth was looking elegant in her Emilio Pucci dress and earrings from Alexandra Mor. While her dress wasn't from the range, Kate wore it with a Prabal Gurung for Target + Neiman Marcus clutch bag, plus co-ordinating black point-toe heels which were also by Prabal Gurung. Karlie Kloss was at the Target + Neiman Marcus Holiday Collection Launch event in New York City on November 28. Karlie wore a festive star-embellished dress, designed by Jason Wu who has items in the Target + Neiman Marcus range, along with her new shorter 'do worn in waves. In the Target + Neiman Marcus collection, top designers have created over 50 items from sunglasses to dresses like Karlie's for Neiman designers at more Target-like prices. Target + Neiman Marcus items will be available to buy from December 1. Miranda Kerr was papped with pet Frankie in New York on November 25. Miranda was fab in her sheer black blouse, skinny jeans and leopard print shoes from Prada. Her sunglasses are Miu Miu, and her black bag is the Givenchy she's been seen carrying a few times lately. Get a similar leopard print loafer look with Sam Edelman's "Alvin" Loafers, or Steve Madden's $59.00 Leopard Print Loafers which also come in other prints like the ones shown. Olivia Palermo attended the Marie Claire Prix de la Moda Awards in Madrid last week. Attending the Spanish event, Olivia went for a long column of black in her jewel-neckline dress. Her heels were Christian Louboutin and her clutch was the faceted clutch bag by Rafe which costs $495. Cher Lloyd was in Universal City, California for the Black Friday Concert on November 23. Cher teamed army print jeans with a chic white jacket and fab gold necklace. Her black buckle ankle boots are Jeffrey Campbell's "Iverson" sneakers. A brown version costs around £170 at nordstrom. Cher's jeans are by de Chemin Jeans - an L.A. brand. Cannot find any links to buy on-line though. 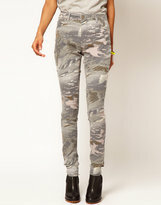 Get a similar look with ASOS's camouflage print jeans which are around $34.00. Not your average premiere attire, Jessica Biel opted for a metallic trousers and top combo from Oscar de la Renta while at the screening of Hitchcock in New York. Jessica's heavily beaded and embellished ensemble was paired with crystal sandals from Manolo Blahnik, and co-ordinating drop earrings. While Once Upon a Time co-star Ginnifer Goodwin kept it fairytale light in her sugary pink, Jennifer Morrison was more evil regal in her dark Abed Mahfouz design at the AMAs on November 18. Attending the L.A. event, Jennifer wore the black gown with Christian Louboutin platform heels. Get a similar platform look with the Sabine Patent Platform Peep Toe Platforms which cost $25.00 at amazon.com. For Heidi Klum and Taylor Swift it was all about the legs at the AMAs. Attending the awards at the Nokia Theatre in L.A. on November 18, both Heidi and Taylor opted for metallic minis that showed off a lotta limb. For Heidi it was a gold Alexander Vaulthier design, along with point-toe Louboutin shoes, oversize hoops, and sleek up-do. Taylor also elected an up-do plus her long fringe, her metallic Zuhair Murad dress was teamed with a matchy clutch and coordinating Jimmy Choo heels. 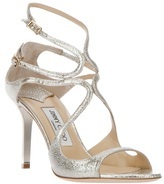 The Jimmy Choo "Loila" sandals are $775 at nordstrom.com. Attending the AMAs to present an award, Ginnifer Goodwin was the light to Once Upon a Time co-star Jennifer Morrison's dark, in a sweet sugary pink dress. The pretty pink Oscar de la Renta dress was sprinkled with sequins and paired with silver metallic Jimmy Choo sandals, and a crystal clutch from Judith Leiber. Ginnifer's strappy silver Jimmy Choo sandals cost $640.00 at farfetch.com. Always one for a quirky touch, Ginnifer has a hint of '60's style with her long lower lashes. A few candids of Selena Gomez papped at a gas station in Hollywood a few days back. Selena was casual in a tee and jeans look plus plaid Rails shirt and army print jacket. Her black boots are Vince Camuto's "Walt" boots which cost $248.95 at nordstrom.com. Victoria Justice arriving for the Nickelodeon 2012 TeenNick HALO Awards in Hollywood on November 17. Victoria was looking chic in a red Oliver Tolentino dress along with sleek updo and Allen B. Schwartz shoes. 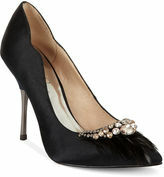 The black Allen B. Schwartz crystal-embellished "Tosca" heels cost $145.00 at macys.com. Her ring was from Soffer Ari and her earrings were Renee Sheppard. Jessica Simpson was at the Dillard's store in Tampa, Florida to do some signings for her Jessica Simpson Clothing Collection.